Preparation for a pre-Thanksgiving meal at Casa de Yeomans. No secret here - huge, huge fan of Veggie Grill's menu + the addiction has been real for some time. Now, their Thanksgiving spread is hands down my favorite plant-based meal I've had. Like, ever. It was such a treat to work with the team at Veggie Grill to host an intimate group of Mamas. 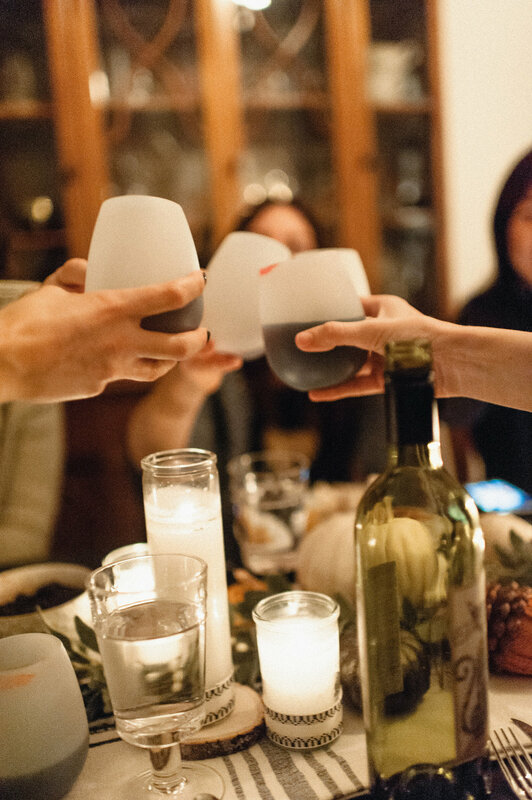 A little bit of wine, a little bit of vegan roast (incredible) + lots of laughs with stories of parenting in the wild. Lyndsey Yeomans opened her incredible Cal Heights home and her images of the night are some of my favorite yet. 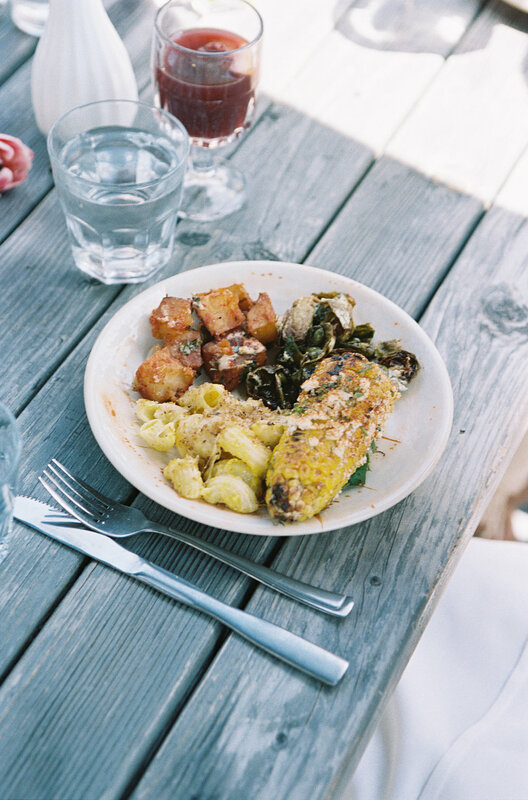 Scroll through for details about the menu, the simple decor (thank you Joanna Gaines + Target) and the details that make for a relaxed gathering. Enjoy! We started prep about 3 hours before guests arrived (and turned on the oven immediately - more on that soon). The linens were a mix of Magnolia's Hearth and Hand line and favorites from Hen House Linens. Prayer candles are so easy and so cheap - I dressed these up a bit with fabric linen. A mix of gourds and small pumpkins lined the table with additional accents from Michael's and Home Goods. To keep the tone informal and inviting, I pulled everyday dishware from Anthropolgie. Okay so back to the incredible, plant-based, super family pleasing meal from Veggie Grill. They spoiled everyone with ready-to-cook Holiday Roast, Thanksgiving Porcini Gravy, Cornbread Stuffing, Green Bean Casserole, Mashed Yams + Cauli-mashed Potatoes and Cranberry Sauce. All of it was packaged and ready to go at their local restaurant. All I needed was an oven to make everything come to life. All the dishes were flavorful and worthy of a 2nd trip down the serving line. There isn't a better time than now to simply rejoice in the company of friends and family. The bonds between parents in particular can be "life-giving", as my pal Johanna once sweetly put it. Photo by Lyndsey Yeomans at The Merchant. A good friend of mine once said "Becoming a Mother is the great 'equalizer' - what we did before having kids doesn't matter so much anymore. It's all about how you now raise your children + grow as a person with them". That remark has always stuck with me because it is very, very true. We are all in this together and being a parent is hard work. Why feel like you're at it all alone? Or when you're stuck, why feel like you're the only one "in it"? We're ALL in it. That is why I wanted to start a morning gathering series that was full of intention + support. The Mama Mornings series that starts September 6th and will meet every other Wednesday until December 13th is meant to be a relaxed, encouraging space where we can bring our common issues, struggles and successes as Mothers to the table. Even if you think you have everything going smoothly (which you probably do! ), there is no better time than right now to create more meaningful connections in your community. Coffee, light bites, notebooks and some toys for the crawlers will be provided. Weather permitting, we'll meet at the Marina Vista Park (adjacent to playground + parking area) at 9:30AM. Each gathering is $8 to cover food + supplies; however, if this is something you can't slip into the family budget right now, just drop me a line + we'll figure it out! Come as you are, feel free to bring your little ones (crawlers only, please) + invite friends who this may interest - all are welcome! RSVP is strongly encouraged to better prepare for group size. Email lauren@thelighthouselb.com. Celebrating Mama-to-Be, Johanna at Padre Restaurant. Last month, our pal Johanna Tropiano was the guest of honor at her shower for Baby Lila. Hosted by her good friends Annette, Britt + Kelsie, they filled the celebration with sweet details and yummy food. 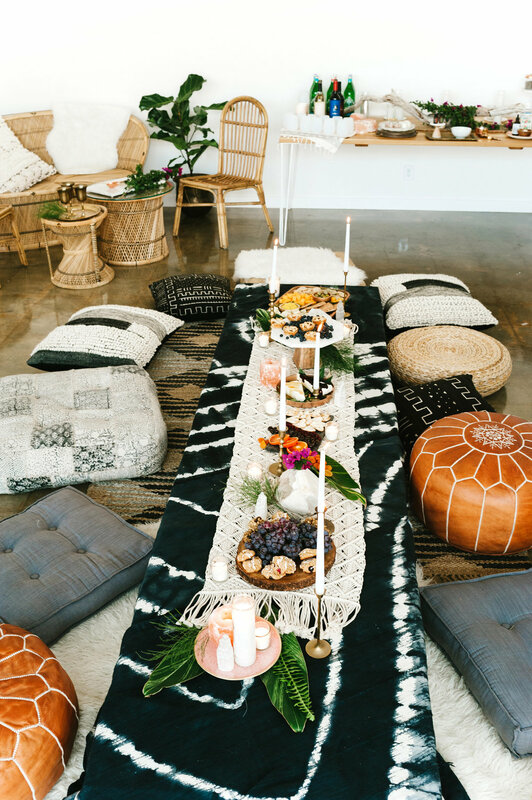 While we don't normally highlight baby showers here, this gathering was too thoughtful, personal and oh-so-Long Beach not to! The below images were taken by the Mama-to-Be's very talented husband and wedding photographer, Brian Tropiano. How did you want your shower to feel or look? I wanted a boho vintage vibe: lots of vintage patterns, pillows and textured materials and a giant peacock chair. Oh, and lots of flowers! I’ve had visions of budding flowers opening into full bloom throughout my pregnancy and felt connected to that metaphor as I’ve been growing my baby, waiting for her to bloom, so having tons of flowers to celebrate that was very important to me. What was your favorite detail of the day? So hard to choose! 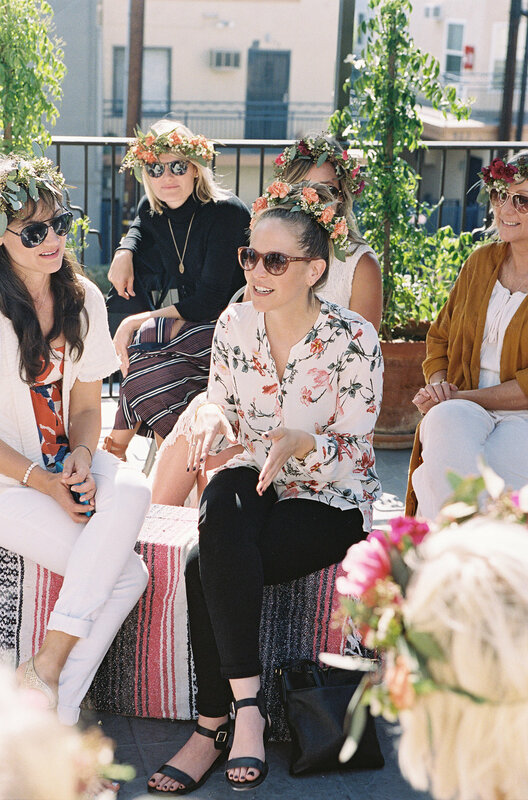 I really enjoyed the flower crown workshop all the guests did. We learned how to make our own flower crowns and that was what everyone was able to take home with them as a keepsake. I have mine dried out and hanging in Lila’s nursery. Also, for each gift I opened, the friend who got it for me shared their favorite family tradition or a word of encouragement. That was very special to me. Any particular menu highlights or specific requests you had? How about the drinks? I LOVE Padre’s sangria, sadly I couldn’t partake, but they made me a special lemonade because lemonade has been my go-to drink that has helped get me through this really tough pregnancy! Baby showers can be overwhelming for soon-to-be Mamas. Any pieces of advice you’d like to share with other women who may be in your shoes soon? Let your friends plan away! Kelsie, Annette, and Britt designed everything. I just put together a Pinterest board and they made it come to life. My shower was even more beautiful than I could have imagined, and letting them take the reins on all the details was such a gift! After the event, how did you feel about your pregnancy? Did it make things feel more exciting? Because my pregnancy has been difficult, I felt super isolated and lonely throughout the last 8 months, so getting to reconnect with my friends who are all so special to me was such a gift. My shower helped me push through the last month and a half, and I pretty much grinned for two days straight because of all the joy my shower and seeing my friends brought me. I felt so loved and I know Lila Vienne felt loved too. Being pregnant is so much fun, except for when it's not. :) Johanna's honesty about her own story and the joy she found in the bigger moments surely resonates with some of you out there. Her baby shower was overflowing with love and care and it is an honor to share it here! Olive and Bloom led the floral crown workshop and did the florals. Cakes were by Scratch Baked Goods in Long Beach. Britt Berres of Britt Leigh Designs and Michelle Qazi from 6th and Detroit designed the shower. 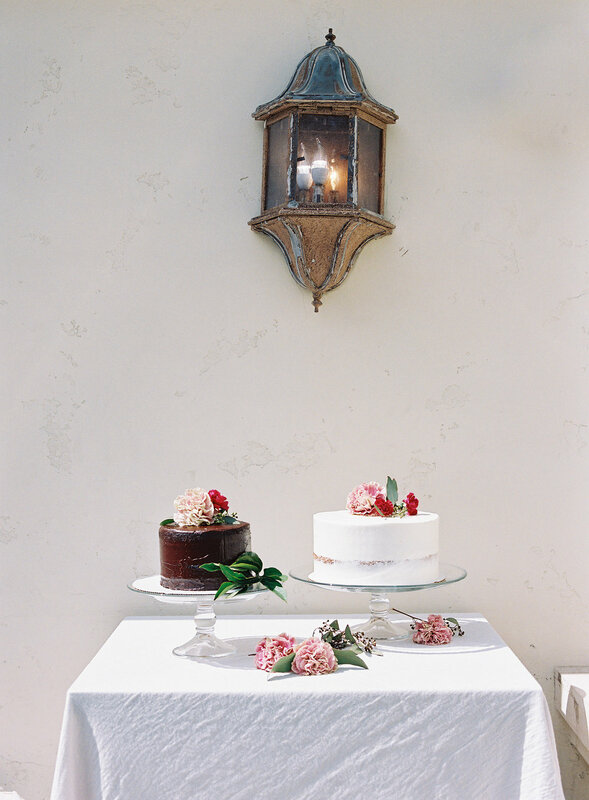 Vintage rentals were from Michelle Quazi and her local Long Beach shop 6th and Detroit. Photos were by Brian Tropiano for Braedon Photography. Jo's dear friend Jess Puccinelli did the gorgeous custom hostess gift boxes. You can find her at Haute Hope. If you're anything like me, the idea of making your own skin products on top of working, cleaning, cooking and squeezing in a simple work out sounds daunting. Too many Pinterest boards, not enough time to actual DO the thing. Well, in fact, I (and perhaps you too) was wrong! 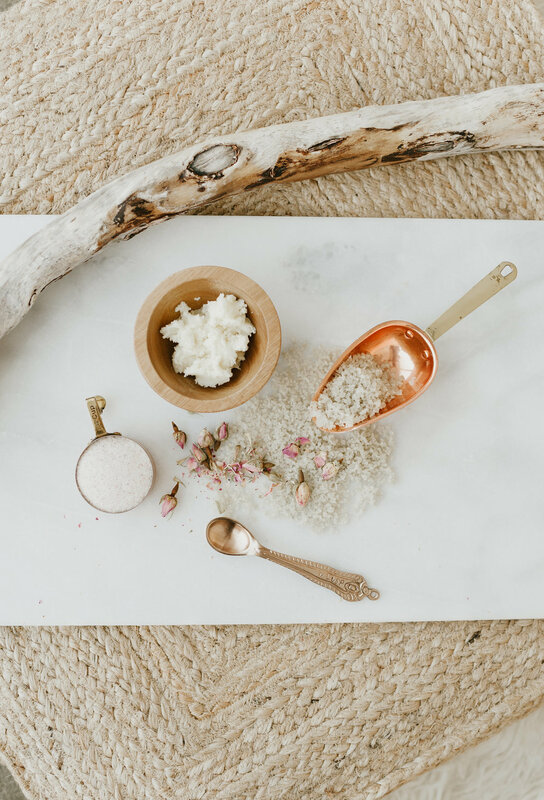 My incredible friend Beth Giles (whom you've met here + here) and I chatted a bit ago about how to make the approach to making natural beauty products at home more inviting. It was a simple idea. It was decided that I would bring the wine, food and design. 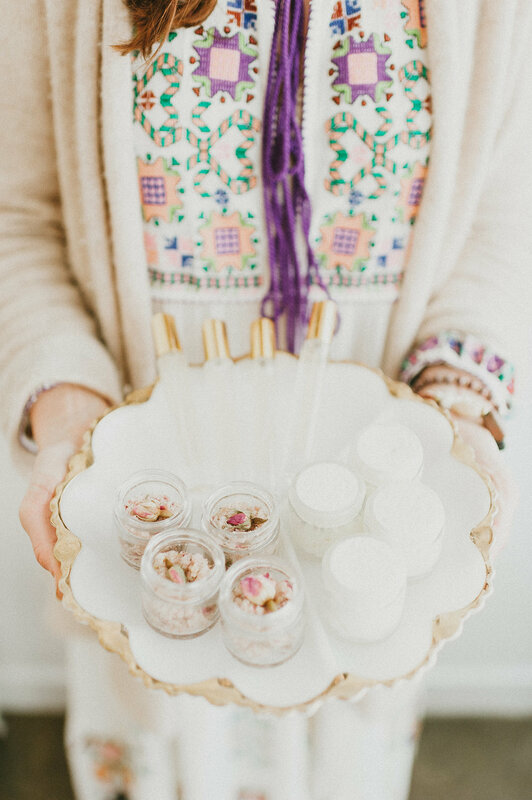 Beth would bring the teachings, essential oils and ingredients for the beauty products. So we did! And the results turned out to be a lovely evening of discussion, relaxation and a bit of intention sharing with an intimate group of local Moms. My gal Lyndsey captured the scene at Wild Child Party Shop earlier that afternoon before everyone arrived. 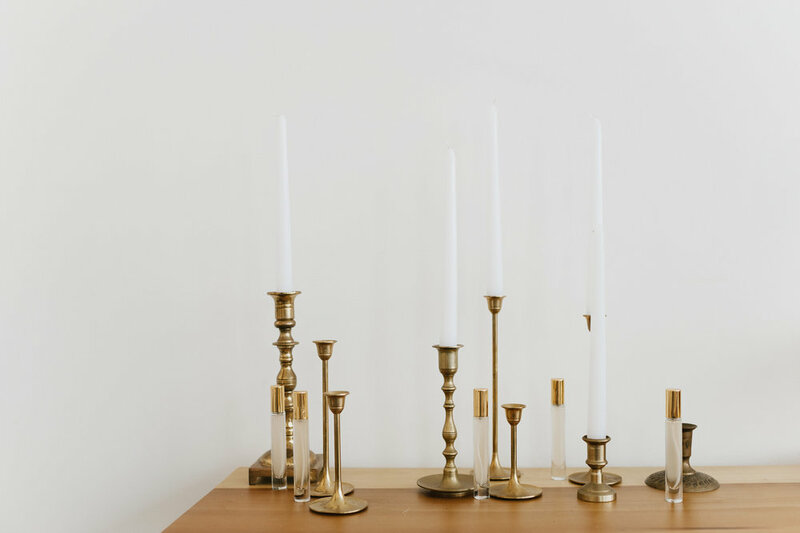 Kendall of Wild Heart Rentals provided a slew of the gorgeous decor furnishings you see in these images including the vintage brass candle sticks above. Later that night the candles were lit for an inviting space for the amazing guests. For the lounge seating, I knew the ladies at Witty Rentals were the ones to call for the best cushions, rugs, + pillows. Their hand-picked pieces complimented the tone of the event perfectly. It was a fun evening and my hope is to develop a rhythm with our events series over the upcoming months. If you missed our inaugural gathering, we hope to see you soon at the next one! The goal of each event is simple - create space for each other to just BE. As a Mother, that can be a huge luxury. We want to make it easy for you to sit back, drink wine, commune and relax! 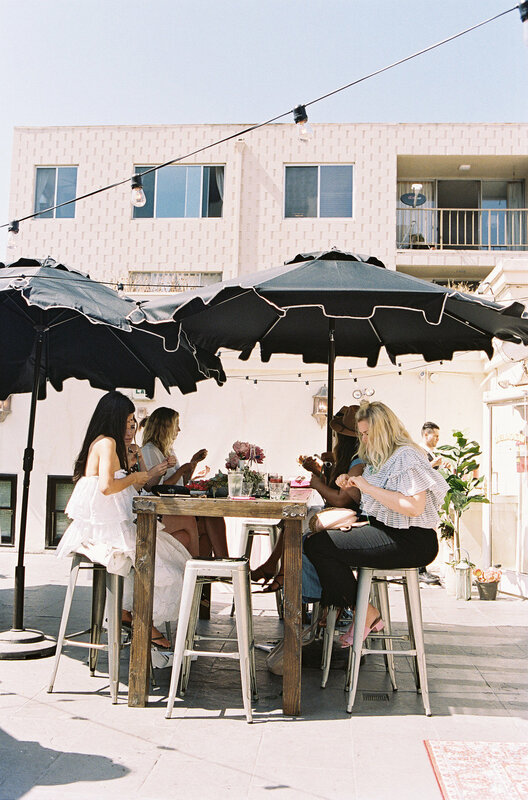 This event of course would have remained just a blissful daydream if it wasn't for the incredible women who supported it - Jolie, Beth, Tiff + Chels, Kendall, Rachel + Lynsdey. Love you all dearly!